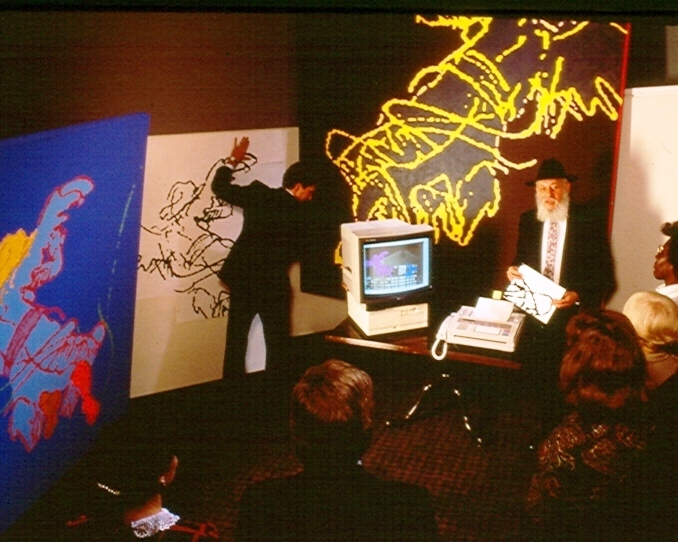 “Art is a Computer Angel” is one of 52 posts in a postdigital blogart project created by artists Mel and Miriam Alexenberg to celebrate their 52nd year of marriage. During each of the 52 weeks of their 52nd year, they posted six photographs reflecting their life together with a tweet text that relates the weekly Bible reading from a Torah scroll in synagogues worldwide. See how Mel and Miriam linked this Torah portion to their life with photographs and tweets at http://bibleblogyourlife.blogspot.co.il/2014/01/genesis-7-art-is-computer-angel.html . The concepts in this portion are developed in Mel Alexenberg's new book Photograph God: Creating a Spiritual Blog of Your Life http://photographgod.com that he wrote as a sequel for the general reader to his book The Future of Art in a Postdigital Age http://future-of-art.com. It explores the vibrant interface between selfies, social media, and spirituality. We enjoyed sitting together in the Metropolitan Museum of Art print room holding Rembrandt's drawings and etchings of angels in our hands. Art is a computer angel. The biblical term for art (MeLekHeT MakHSheVeT) is feminine. The masculine form is computer angel (MaLakH MakHSheV). 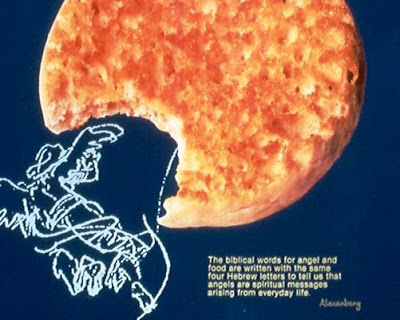 The biblical words for angel and food are written with the same four letters to tell us that angels are spiritual messages arising from everyday life. We chose an image of an ascending angel to digitize and send on a circumglobal flight on 4 October 1989, Rembrandt's 320th memorial day. We sent it via satellite from the AT&T building in NY to Amsterdam to Jerusalem to Tokyo to Los Angeles, returning to NY the same afternoon. The cyberangel not only circled our planet, it flew into tomorrow and back into yesterday, arriving in Tokyo on 5 Oct. and LA on 4 Oct. In Tokyo, the 28 faxed sheets were assembled in Ueno Park and then rearranged as a ribbon ascending the steps of a Shinto chapel. As we assembled the cyberangel on its return to NY five hours after it had left, TV news sent it into ten million American homes. The AP story of our angel flight appeared in 60 newspapers each with a different headline. AT&T featured it in its Annual Report. For the full story and more images, see “artworks” at http://www.melalexenberg.com.